Jump either one or two spaces in any of six hexagonal directions. 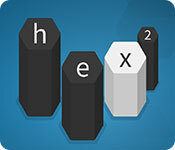 In Hex 2 you’ll encounter multiple different types of tiles, each one posing a new challenge more difficult than the last. It’s up to you to choose the order in which you move, can you clear them all? Hex 2 is rated 4.0 out of 5 by 3. 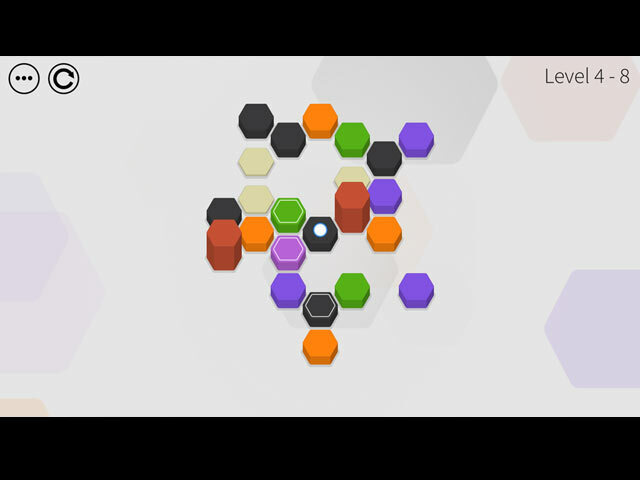 Rated 5 out of 5 by LunaNik from Lovely puzzle game requiring strategizing. Now this is how a puzzle game should be designed! While the concept seems simple—eliminate all tiles from the board—the execution is rather brilliant. Basically, you begin with the active tile, the one with the white dot. You may move to diagonally adjacent pieces one or two spaces away. Sounds easy, right? It's not. 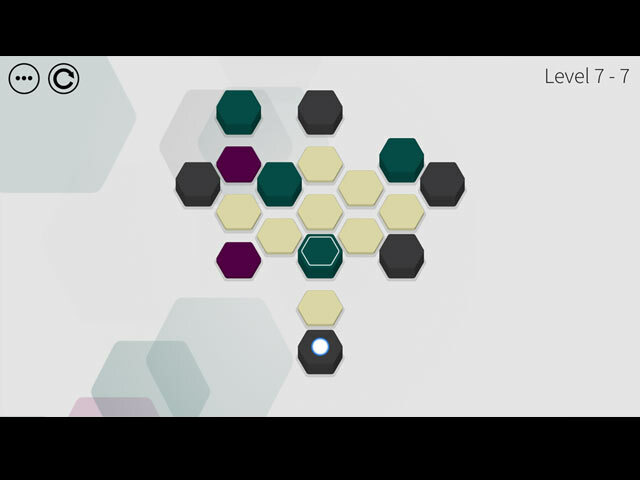 Gameplay gradually increases in difficulty, both by presenting more complex patterns and by adding new tiles with special properties. For example: • The black tiles are standard; visit them once to clear them. • The tall, orange tiles are walls you cannot jump over. • The white tiles remain on the board, so you may visit them multiple times. • The grey tiles must be visited twice before they're cleared. • The magenta tiles are inactive until all tiles around them have been cleared. Basically, you must strategize to discover the correct pattern to move around each board. The game will notify you if you've maneuvered yourself into a dead end. Wisely, this dev avoided overlaying the gameplay with an unnecessary, silly storyline. The graphics are simple, but modern. And the music is not intrusive or annoying, but relaxing. Lastly, the options to customize your game are excellent. • Having trouble discerning the spacing of the tiles? (This was an issue for me in the first edition.) There's an option to overlay a grid. • Are you color blind? No worries, because there's an option to add unique symbols to each color so they're easily distinguishable from one another. • Don't want music or sound? You can control the volumes of both elements separately. CONCLUSION ????? 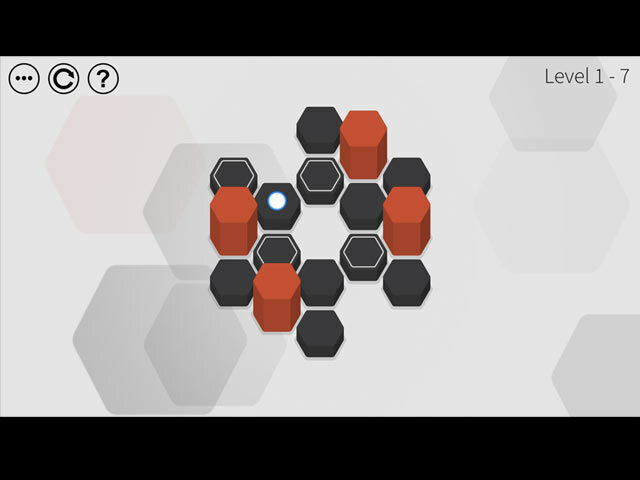 If you like games that challenge you to think your way to the solution, this one's for you! Rated 4 out of 5 by Eveoflove from Activate your little grey cells I played the full 60 minutes of the first "Hex" game, and this 2nd edition provides visual improvements (a grid and optional symbols if you have color issues); it's clean, simple to understand the rules and has a great tutorial! The mechanics are simple and easy: just click on the tile you want to jump to, without any frenzy as there is no clock. The game also allows you to replay any level, which I bet is something you'll have to do within the demo period. You'll need to think ahead by visualizing where your moves would lead you, which will get increasingly difficult as you'll need to think which tiles have evolved/disappeared. Those who are great at chess will have some advantage on this one: you must think many moves ahead to succeed. Challenging for sure and it doesn't take long to get to that point, though every person is different. I deducted 1 star as there is no hint/solution system... so if you get stuck on a level and can't figure out the solution after multiple attempts, too bad... a little bit frustrating. I suggest you try it for many levels to see how far you can go before you get to "pause and ponder"; I also suggest that if you like the gameplay on this one, start by buying this 2nd edition instead of the 1st game which doesn't have all the improvements made here. If your brain can take it, then get the 1st release. This will provide many hours of entertainment, and maybe a bit of brain exhaustion!